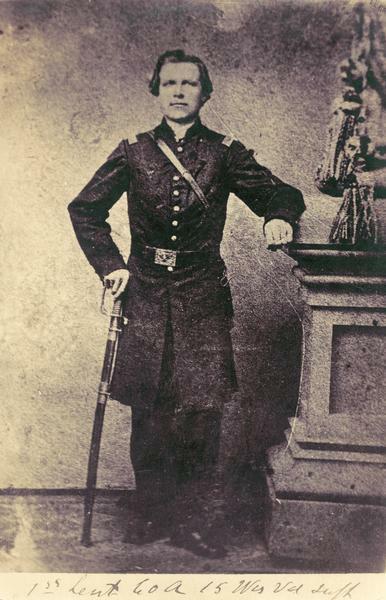 Full-length studio portrait of Civil War soldier Nils (Niels) J. Gilbert, Company A, of the 15th Wisconsin Infantry, believed to have been taken in October 1864 at Chattanooga, Tennessee. He is in uniform and leaning on his sword. He entered service on 2 October 1861 as a 1st Sgt, was promoted to 1st Lt. on 19 October 1864, and mustered out on 20 December 1864 when his term expired. For two more images of Nils J. Gilbert, see Image IDs: 80046 and 92553.